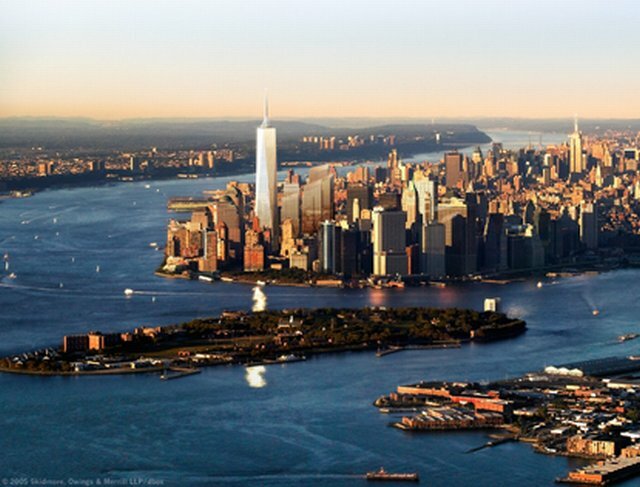 The revised design for the Freedom Tower will soar to 1,776 feet in the sky and serve as an inspirational and enduring beacon in the New York City skyline. The Tower’s design evokes classic New York skyscrapers in its elegance and symmetry while also referencing the torch of the Statue of Liberty. The revised Freedom Tower builds upon the original’s extraordinary level of life safety features and will include other features that will make it unprecedented in terms of life safety and security. In addition, the Freedom Tower will further its distinction as a world-class model of energy efficiency and environmental sustainability. As part of the new design, the tower’s footprint, measuring 200 feet by 200 feet, is the same size as the footprints of the original Twin Towers. As the tower itself rises from its cubic base, its square edges are chamfered back, transforming the square into eight tall isosceles triangles in elevation. At its middle, the tower forms a perfect octagon in plan and then culminates in an observation deck and glass parapet (elevation 1,362 feet and 1,368 feet – the heights of the original Twin Towers). A mast containing an antenna, designed by a collaboration of architects, artists, lighting designers and engineers, and secured by a system of cables, rises from a circular support ring, similar to Liberty’s torch, to a height of 1,776 feet. In keeping with the original design, the entire composition evokes the Statue of Liberty’s torch and will emit light, becoming its own Beacon of Freedom.